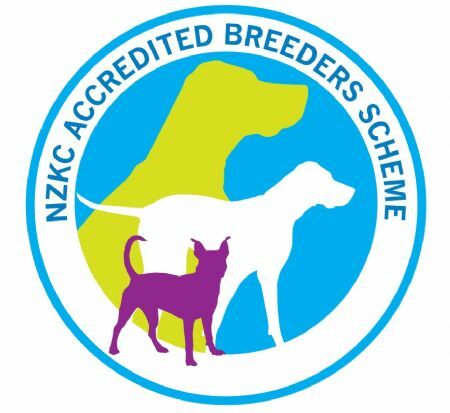 What is the NZKC Accredited Breeders Scheme? What is an Accredited Breeder? Ensures their breeding stock and progeny are NZKC registered. Advises new owners about the NZKC Register that the dog is recorded on and explains any endorsements that may be applied to the puppy and why they have been applied. Permanently identifies breeding stock by DNA profile and microchip or tattoo. Makes use of health screening schemes (as they become available), relevant to their breed, on all breeding stock. Ensures their puppies are well socialised before going to their new homes. Provides written advice to new owners on feeding, worming, socialization, exercise and future training of their puppy. Provides a written record (from a veterinarian) on the immunisation measures taken to date on the puppy. Is available to give reasonable post sale advice to the new owner. Will assist if necessary in the re-homing of the dog, for whatever reason throughout the dog's lifetime. Will advise the buyer of any know inherited disorders that the puppy or adult dog may be predisposed to which may cause health welfare problems during the dog's lifetime. Provides the new owner with a Sale and Purchase Agreement, detailing any of the endorsements that may have been placed on the dog. Advises the new owner about the requirement and recommendations that apply to them as an Accredited Breeder and also make the buyer aware of the NZKC Complaint Process. Provides written advice, in the Puppy Sales Wallet on the continuation of socialisation, exercise and future training. Why Buy a Puppy From an Accredited Breeder? They are purchasing a pedigree puppy from someone whose priority is the health and welfare of the the puppies that they breed. The breeder will give a quality, supportive and informative service both before and after they take their puppy home. The sire and dam of a puppy have been tested for all required health tests, relevant to the breed, and that the breeder will provide you with accurate information about the results of these tests. The sire and dam have been DNA profiled so the parentage of the puppy can be verified. The Breeder has signed and agreed to the Accredited Breeders Code of Ethics and Code of Practice. These can be viewed on the NZKC Website. The breeder will advise you of the process should you wish to lodge a complaint.